Spring is officially here! It’s time to turn off our heaters for the season and turn our attention to our air conditioners without giving it a second thought. In these final days of cooler weather, neglecting your heater is actually the last thing you want to do. If you had maintenance done this past fall, you likely don’t have much to worry about. But even with maintenance, good old-fashioned wear and tear can wreak havoc on an aging heater, and just ignoring problems ‘til next year can leave you with a completely malfunctioning heater in the fall! So, what should you do? First off, you should have repairs done now if they’re needed. If your heating system shows any signs that it is having performance issues, don’t ignore them just because summer is approaching! 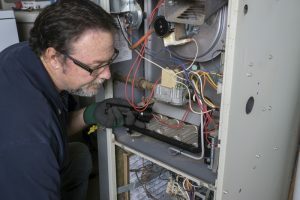 After all, the problem might be caused by something like a malfunctioning thermostat or damaged ductwork—both of these being issues that will negatively impact your air conditioner this spring, too. Of course, it order to schedule repairs, you would have to know or suspect that something is wrong in the first place. What signs can you watch out for? Your heater is making strange sounds, such as groaning, whining, or even booming (this can be damaging to your heat exchanger and you’ll want to have it checked out right away, for your safety). There’s low airflow or low heat coming through your vents, even though you keep turning the thermostat up. Your heating bills are much higher than they were last year, even though you didn’t use it anymore this year than you did then. Your gas-powered heater’s pilot light is burning yellow. Your furnace is struggling to either stay on, or keeps running and won’t shut. Did you know the air filter within your HVAC systems isn’t there to protect your indoor air quality? This is a common misconception, but it’s actually there to protect the system itself from dirt, dust, and other debris that can harm its performance. Given that, your air filter needs to be changed (or cleaned) on a regular basis. It will depend on what type of filter you have and what the level of contaminants in your home is, but generally speaking your air filter should be changed every 1–3 months during periods of use. Since this air filter is used by both your heating and cooling systems, neglecting it can cause problems with both. “Wait, isn’t it too late for that?” you may be wondering. It’s far more important that you have heating maintenance done on a routine, consistent basis than it is what time of the year you have it done. Sure, it’s convenient to schedule this service in the fall before you need the system the most. But if you skipped it this past year, there’s no time like the present to get it on your schedule! When you need a trustworthy HVAC contractor in Puyallup, WA, contact Sunset Air!